Crevillente is a small town set inland in the comarca of Baix Vinalopo and lies at the foothills of the Serra de Crevillent in the province of Alicante in Spain. Crevillente (also known as Crevillent) has a permanent population of almost 30,000 inhabitants who live in the market town. It is very dry around Crevillente and the vegetation surrounding the town consists mainly of carob trees, almond trees, olive trees and esparto. Crevillente is also a major producer of carpets. Historically Crevillente dates back to Roman times. In 1263 during the times of the Reconquista, James I of Aragon captured the city from the Moors and it became part of the kingdom of Valencia. Below we have an interactive guide and map of Crevillente for visitors and tourists visiting the small inland town of Crevillente on the Southern Costa Blanca coast of Spain. This free Google map of Crevillente can be used in many ways: as a streetmap of Crevillente, as a map of Crevillente hotels, as an Crevillente apartment map, as a way of getting driving directions to Crevillente or as a map showing the main tourist attractions and sights in the town. Crevillente can easily be accessed from the A7 Autovia del Mediterraneo and then from the national road the N340. 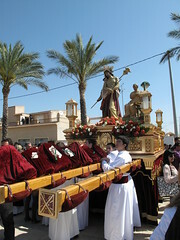 The nearest town and city to Crevillente is Elche while a little further away are the cities of Alicante and Santa Pola. There is no doubt that explore the region properly you will really need to look at Crevillente car hire which can be obtained locally but the easiest option is to hire a car directly from Alicante airport once you arrive in Spain. Use the Crevillente car hire price comparison website tool below to quickly find the cheapest car hire for Crevillente in Spain in just seconds. The free price comparison search engine below will compare all the current Crevillente car hire deals and car rental rates to give you the lowest and cheapest car hire for Crevillente. The nearest beach to Crevillente is the Arenales del Sol which is located south of Alicante and the Carabassi Beach in nearby Gran Alacant is also worth a visit. Further down south are the great tourist resorts of Guardamar del Segura and Torrevieja with their beaches, promenades, bars, restaurants and some nightlife. The weather and climate in Crevillente is excellent. Crevillente is an inland town on the southern Costa Blanca coast of Spain and enjoys more than 2,800 hours of sunshine each year with an average annual temperature of 19.3 degrees Celsius. We show you the weather now as well as today’s weather in Crevillente, the latest current temperature in Crevillente and the conditions in Crevillente i.e. sun, cloud, rain, overcast, clear, etc as well the humidity, pressure, wind direction and wind gust strength. We also show the predicted daily high and low temperatures and chances of showers and rain to help you with any travel plans. You can click on the graphic and get a much more detailed weather outlook including: tomorrow’s weather in Crevillente, long range forecast, a weather map showing any pressure systems, visibility, UV, pollen count, dew point, where the weather station providing this data is located, a 5 day, 7 day (week forecast), 14 day, 15 day and 10 day forecast for Crevillente weather. Because the Crevillente weather and climate is so favourable, Crevillente has become a popular tourist destination for sun lovers enjoying approximately 325 sunny days each year as well as a place for many expats to live on a permanent basis. If you are looking to buy property in Crevillente, Spain then you will almost certainly need to find a list of Crevillente real estate agents. Our list of estate agents also helps if you are looking to find properties for sale or rent, or if you are wanting to sell your own property. At first glance the town of Crevillente simply appears to be a modern industrial town which you might easily pass by however it does have a long and fascinating history and was in fact occupied even before the arrival of the Romans in Spain some 2,000 years ago. Early settlements were established by the Iberians, and these were extended somewhat when the Romans arrived, though the town did not really develop until the Moorish occupation when agricultural methods enabled the area to be cultivated. During the 18th century a carpet industry emerged turning into a significant earner for the town, early carpets were made from esparto grass and were mostly exported. In the town today the best sights are to visit the old Town Hall and take a look at the oldest church the Nuestra Senora de Belen, nature lovers can visit the El Hondo Nature Reserve which is close to the town, some nearby villages which may be of interest are Cox, Albatera, Aspe, Callosa de Segura and Hondon de los Frailes, a trip into the city of Elche would also be well rewarded.